Note: I wrote this blog in 2012, which means it’s no longer the Year of the Dragon. If you’re planning a Chinese New Year celebration, be sure to check out Healthy Asian Favorites from Steamy Kitchen. Gong Xi Fa Ca! That’s Mandarin for “wishing you prosperity.” The Chinese New Year holiday is based on a lunisolar calendar, which calculates both lunar and solar activity. Each Chinese year is associated with one of twelve symbolic zodiac animals: Dragon, Rooster, Dog, Pig, Rat, Ox, Tiger, Rabbit, Snake, Horse, and Ram (or Goat). In 2012, the Chinese will welcome the Year of the Dragon. The holiday is celebrated with 15 days of fireworks and feasting, leading up to a traditional Lantern Festival on the first full moon of the Chinese year. When I heard that Chinese New Year starts this week, I wanted to cook something tasty to celebrate. Admittedly, I don’t know much about Chinese food. I enjoy eating it, but when it comes to cooking it I’m sort of a novice. I’ve experimented here and there with recreating Chinese dishes from restaurants, but for the Chinese New Year I thought it best to seek help from an expert. I immediately thought of one of my favorite food bloggers (and people! ), Jaden Hair from SteamyKitchen.com. Jaden was born in Hong Kong and grew up in America. She learned traditional Chinese cooking from her mom via cell phone. After moving to a small town in Florida with her husband and discovering a lack of authentic Chinese markets or restaurants there, she sought cooking advice from her Chinese mother in California. Jaden racked up close to $450 in cell phone minutes– which, as she puts it, “is way cheaper than three years at a fancy culinary institute.” Around that time, she started her famous blog Steamy Kitchen, which eventually turned into one of the most popular food sites on the internet! Jaden and I met last summer at the BlogHer conference in San Diego and became fast friends. 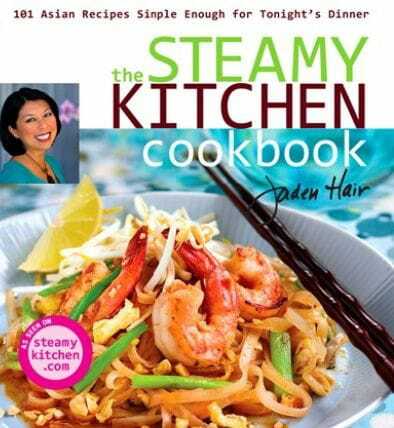 I went out and bought her first book, The Steamy Kitchen Cookbook, which is filled with easy Asian-inspired recipes that you can easily recreate at home. I love the simplicity of these recipes… most of them are so quick, you can take them from stove to table in 30 minutes or less. Can’t beat that! A heads up for my kosher readers– The Steamy Kitchen Cookbook is not kosher. Chinese cuisine is all about pork, shellfish, and copious amounts of oyster sauce. But the book does have some yummy recipes that will work for a kosher diet, including the one I’m sharing with you today– Sweet and Sour Chicken. If you don’t keep kosher and you like Asian-inspired food, this cookbook is definitely worth a look! I love Chinese takeout, and the recipe didn’t require any unfamiliar ingredients, so I thought this would be fun to try for the Chinese New Year. I found the dish to be pretty tasty as written. The only change I made was adding a couple pinches of cayenne pepper for heat. Add the cayenne with care if you’re sensitive to spice. I also found that letting the dish rest for 10 minutes after preparation allowed the sauce to thicken, which made the chicken saucier and more delish. You can easily make this gluten free by using a certified GF cornstarch, vinegar, and ketchup. You’ll love how easy the dish is, and you may have the ingredients on hand already– it won’t require a special trip to an Asian market. It takes less than 30 minutes to make (including prep time). It’s also much lighter than the batter-fried Sweet and Sour Chicken served by many Chinese restaurants. Who needs all that fried fatty coating when you have so much flavor in the sauce? P.S. I was born during the Year of the Ram (some say the Year of the Goat– I think Ram sounds cooler though). What’s your Chinese zodiac animal? 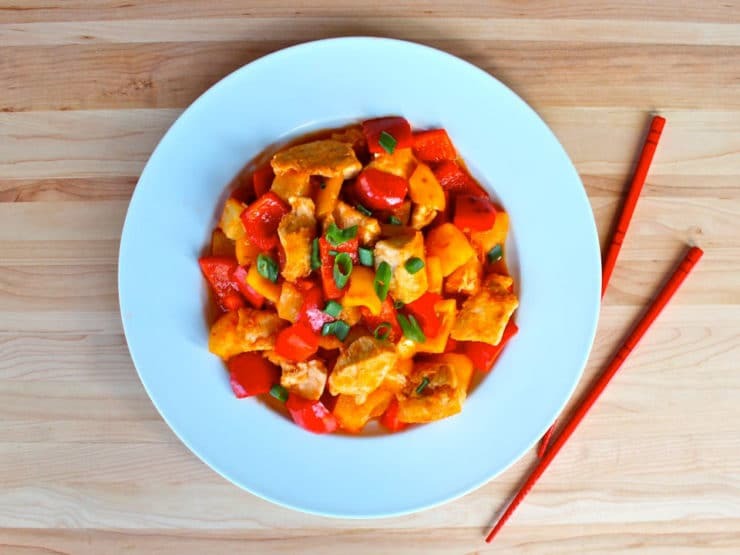 Delicious Chinese-American style recipe adapted from The Steamy Kitchen Cookbook by Jaden Hair. 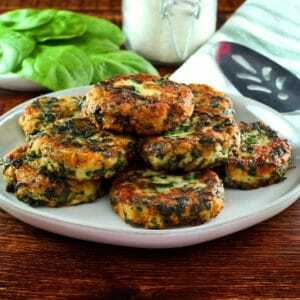 Kosher, Meat, Gluten Free, Easy, Healthy. Meanwhile, whisk together 1/4 cup of the reserved pineapple juice, ginger, vinegar, ketchup, brown sugar, remaining 1/4 tsp of salt, and 1-2 pinches cayenne pepper (or more to taste--optional). 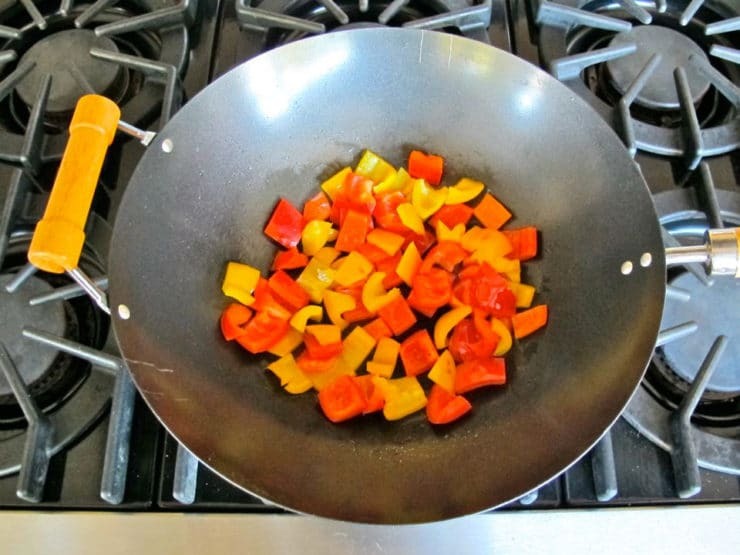 Return the wok to the stove on high heat. When a bead of water instantly sizzles and evaporates, pour in the remaining 1 tbsp of oil and swirl to coat (be sure to fully coat the pan so the meat won't stick). 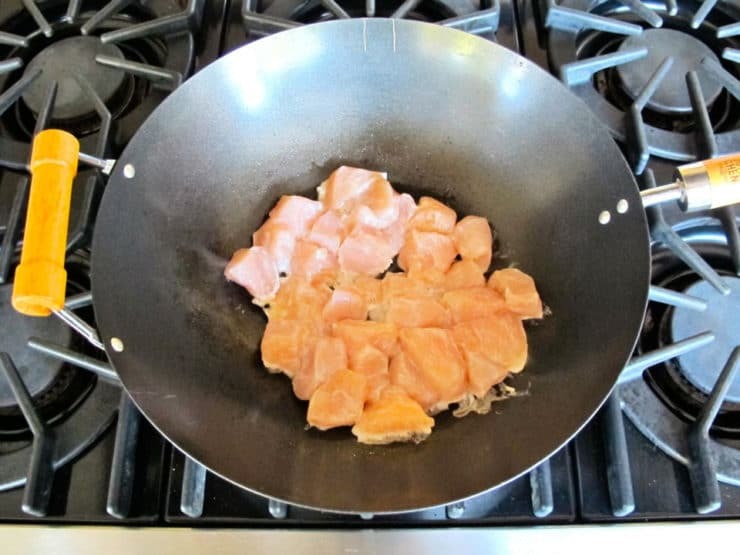 Add the chicken to the pan, spreading it out in one layer. 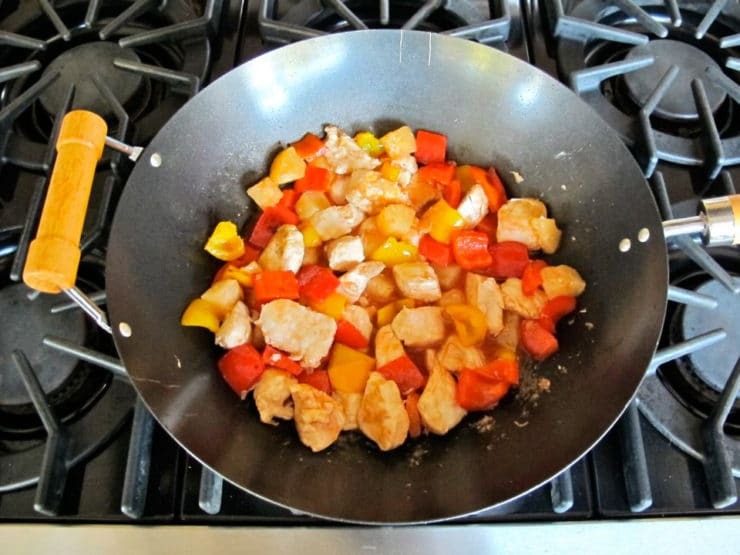 Add the cooked bell peppers, pineapple chunks, and pineapple juice mixture to the pan. Let simmer for about 2 minutes until the chicken is cooked through. Remove from heat. Let the chicken rest for a few minutes till the sauce thickens. Garnish with sliced scallions, if desired. Serve warm as part of a multicourse meal, or over jasmine rice for a complete entree. This looks wonderful! My boyfriend really doesn’t like peppers, but I would love to add some sort of veggie to substitute. Any other suggestions that would go well with the sauce? Hi Sydni, Tori’s assistant Ashley here. Carrots, zucchini, and/or eggplant would work well in this recipe! Hi, as a Chinese, I have to admit that many of the Chinese dishes are non-Kosher. 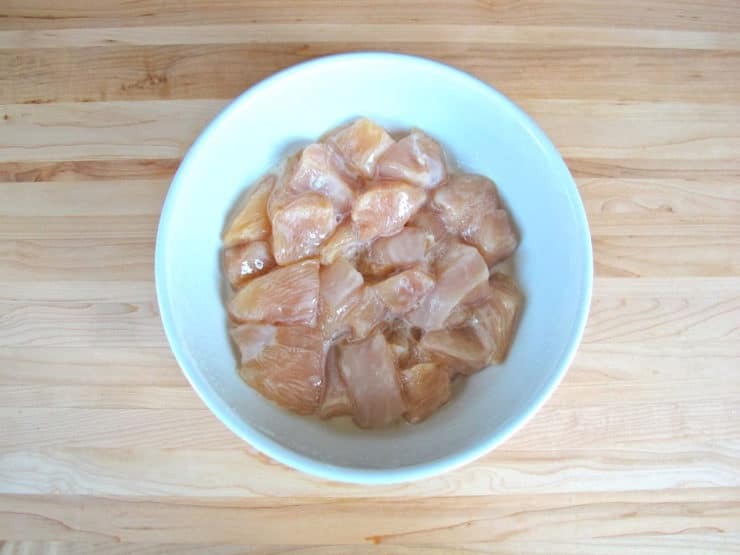 However, you could try “Three-Cup-Chicken”. It is simple and absolutely Kosher! I love this recipe! I’ve made it quite a few times and the last two times, I used 1.75 lbs of chicken, doubled the sauce recipe, went strong on the ginger and cayenne, used a green, yellow and orange pepper, and added a can of water chestnuts (I chopped them up) for crunch when I put the sauce in; served it over brown rice; topped it with the scallions and crushed, toasted cashews. Delicious! Not battered and deep fried like my old/standby recipe, ( most restaurants’. Hooray. Thank you, thank you. I’ve missed sweet and sour chicken SO much. I just made this. I just used rice vinegar and added some red pepper flakes and ohhhh! its so, so good. I’ve made this recipe a few times now, which my husband and I both love! 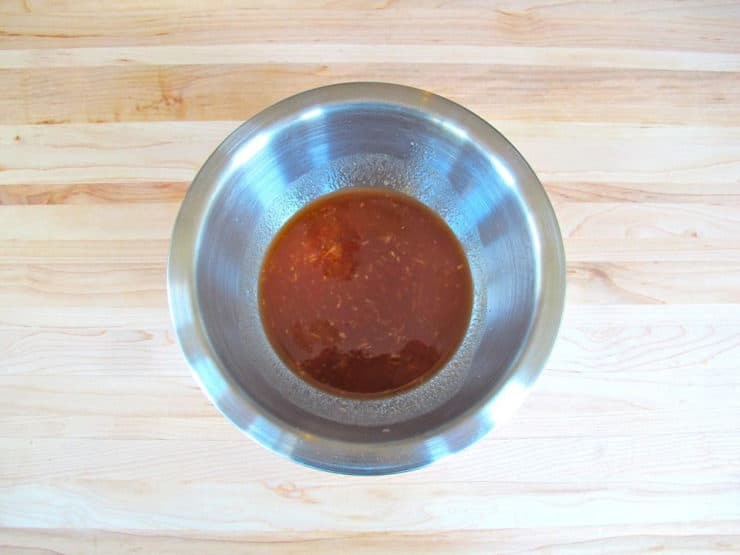 For some reason our sauce doesn’t thicken much when it sits at the end — still delicious mind you, especially with rice. Any suggestions? Perhaps a little cornstarch in the pineapple/ketchup mixture? Thanks for all your great recipes! Hi Molly! I would mix 1-2 tsp cornstarch with the same amount of cold water till smooth, then stir it into the sauce during that last 2 minute simmer. So happy you like the recipe! I’m Year of the Pig! I always wanted to be something more exciting like Tiger or Dragon! I dont think there is “sweet and sour chicken” in Chinese cuisine. That’s american food. sorry. That’s why the blog refers to this as a “Chinese-American classic.” Please read the post before commenting. I’m curious, what’s the purpose of soaking the chicken in the egg whites and corn starch? I’m so happy you enjoyed it Susan! I work hard to make sure all of the recipes on my site are tested for quality and flavor. If I don’t enjoy eating it, I won’t put it on the site. This one is from my friend Jaden, she’s a terrific chef and a very nice person, too! I finally made this tonight- and it was so yummy and DELICIOUS!!!! Even my finicky 15 month old ate it. I don’t own a wok, so I used a skillet and it was still very easy. The rice took longer to cook! Also, I couldn’t find fresh ginger at our grocery, so I used 1/4 tsp. of dried and threw in a minced garlic clove in with the liquid mixture. Thank you for this post. This will absolutely be made again and again! 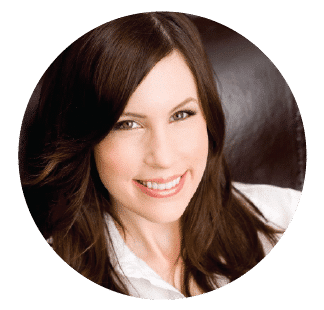 I’m really enjoying your blog and I look forward to joining you on your culinary adventures. This recipe is fantastic! We’re definately making it again. We added some dried red chilis and chopped garlic. Amazing. Question – I would like to make it for this upcoming Shabbat but no one in my family will eat the pineapple chunks (and its pressence might “contaminate” the whole dish for some of my kids..). Ommiting them won’t do considering I would still need to open a can for the juice. Is there a substitute for the pineapple juice in the reciepe? White wine and sugar? a different fruity juice? Wow !!! This looks like a great recipe, no comparison to take out ! I can use organic peppers & free range chicken for my husband (& tofu for me). Can’t wait to try it. Thank you so much. This is my year, the year of the dragon….Woo hoo ! I made it earlier this past week. It came out delicious, I let the chicken soak in the corn starch/egg white mixture and was cooked perfectly. Is there any advantage to having it sit in the fridge overnight? Hi Mark, happy you liked the dish! I don’t think there are any advantages to letting it sit in the fridge; if there are, Jaden didn’t mention it in her cookbook. She did mention that leaving it in the fridge overnight is an option, but I’m guessing that’s a tip for busy parents who don’t want to sit waiting for the mixture to soak before starting to cook. If you try it both ways and notice a difference, I’d love to hear about your results! Your recipe reminded me that I had this dish made with Tofu instead of chicken (I’m a vegetarian). Do you have any hints/ideas for adapting this to substituting tofu for the chicken? Thanks much. Hi Alice– I’m very sensitive to soy, it affects my hormones, so I don’t eat or cook tofu very often (which is a bummer, because I like it a lot!). I think that you should use a firm tofu, and you can probably cook it the same way that you would with chicken– but since I haven’t tried it myself, I can’t promise anything. Can I use ginger liqueur in this recipe? This looks absolutely delicious. I’m putting this on my menu next week! Wow, this loooks delicious. I love sweet and sour. Congrats on the Top 9. What a gorgeous (and simple) dish! Well done. Looks soo tasty. Looks fantastic, and I love how colorful this is! 🙂 I miss Chinese food (spent last summer in China) and a always looking for good ways to recreate the flavors at home. This is probably my most favorite take out dish, but I do need to start making this at home. You did a wonderful job bringing this together and the picture is stunning. 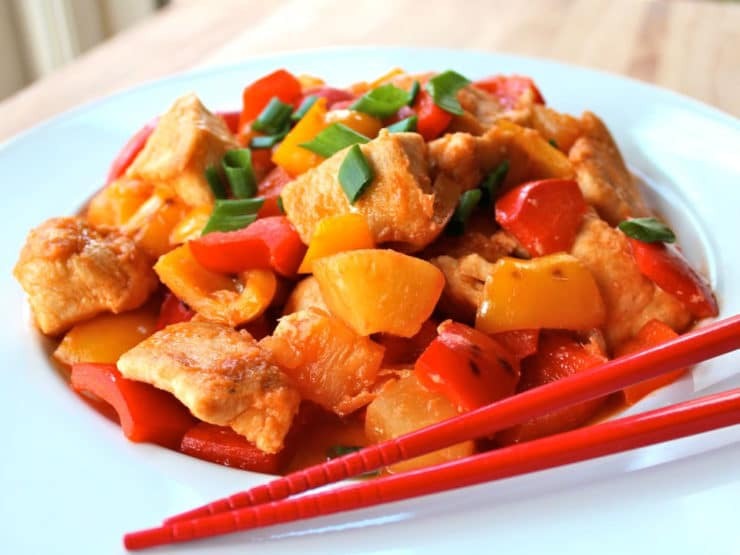 Definitely the first sweet and sour recipe I am going to make! Enjoy the day! 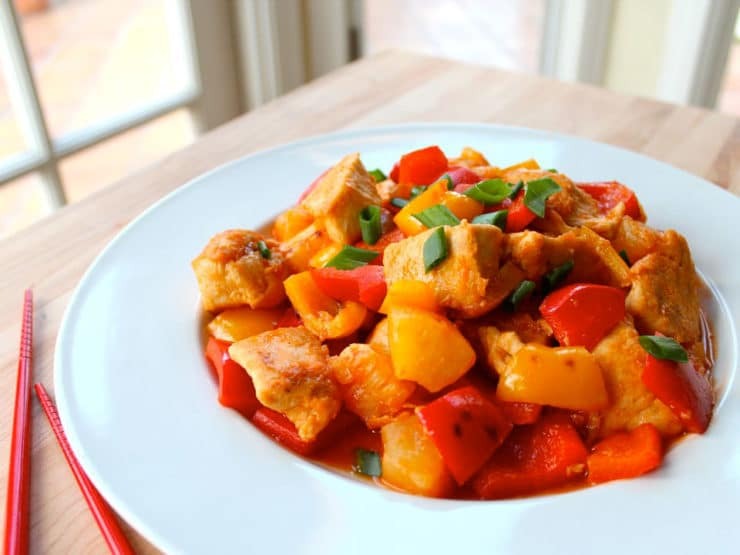 This sweet and sour chicken looks amazing! Beautiful photos too! For someone who does not know a whole lot about Chinese food you sure did make a delicious looking dish! This looks great–so much better than takeout! Happy Chinese New Year! This stir-fry looks delicious, Tory…as always! How nice of you to make it! Oh my I am swooning. Two of my faves in one place today. Be still my heart. You know I adore you Tori. I also adore and worship Jaden. When I first started blogging, and didn’t know how to behave, I sent Jaden an email about giving her an award. She actually very sweetly wrote me back. She even visited my blog a few times. I look back on that and laugh at my bold and silly self. Now if I met Jaden I would probably pass out or mumble like a school girl. This recipe is so fresh and beautiful. Jaden’s book is on my list of cookbooks to buy. Cannot wait till I can purchase it. Oh YUM! This is my family’s favorite meal! Thank you for sharing this! i love this! picture by picture is the best. gives it a more understanding sense. Wow, that looks absolutely delicious. 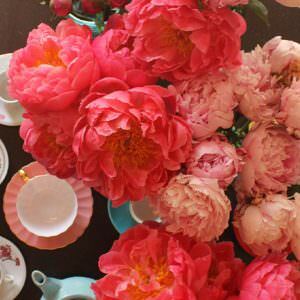 Such vibrant and rich colors. I have no idea what my Chinese year is (though I’d say ram instead of goat too if we shared the same year)!